let's check the calendar for upcoming events. Resident Astronomer Peggy and I elected to forfeit and donate our tickets for a night viewing on the 60 inch Mt. 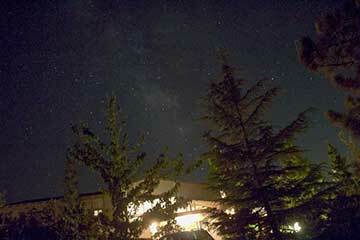 Wilson telescope, which if the original group was lucky, took place last Friday night. I hope all went well and we had given up on ever making it with that group that has been clouded out or fire stormed out for the last three years now. Thanks for all your support, Michelle! Fortunately, I have formed a new group of older star geezers and geezeresas, who can go mid week, for observing on the 60 inch telescope with our first upcoming date in July. We are hoping for clear skies and better luck than our previous group! Resident Astronomer Peggy and I also didn't get to participate in the monthly OCA star party either because we were busy celebrating the graduation of New Computer Scientist, Joe, from CalPoly-Pomona. It has been very rewarding following your journey through college and congratulations, again, Joe! 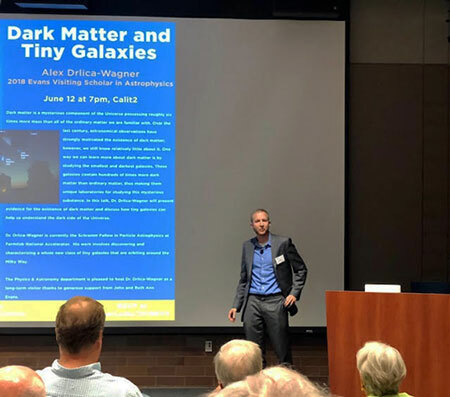 Ok, on to the inaugural lecture, Dr. Alex Drlika-Wagner, Fermilab, described some of his research, using the Dark Energy Survey Camera, to search for tiny, dim dwarf galaxies. This inaugural lecture, sponsored by benefactors, John and Ruth Ann Evans, was fantastic. I meant to thank the Evans, who are sort of pictured in the front row by the podium, but I got sidetracked talking to Science Nerd and Theatre Impressario, Scott, and Might take His Scope to Anza, John, and Author and sometime UCI Usher, John and Wife, and by my asking the speaker a question regarding the dark matter simulations and co-moving coordinates. So, sorry, but yes I would have liked to show my appreciation and support and thanks for all of the people that make it possible for all of the rest of us, physicist wannabes, to enjoy these various lectures and events. Apparently from my internet searches, John Evans, after rising to senior VP at Wells Fargo, has been a big benefactor throughout Orange County. Anyway, I didn't find the chance to thank them, and if the truth be told, I spent part of my free time searching for wine during the reception, of which there was none, strangely enough, and I had to content myself with a white chocolate macadamia nut cookie. Umm, good! But, seriously, Alex was a very impressive speaker and I learned more from him in many hours of previous study. 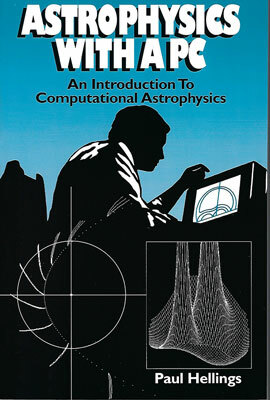 He laid out the three major separate lines of argument in support for dark matter, (1) CMB spectrum, (2) Gravitational lensing observations, and (3) Nucleosynthesis following the big bang and of course (4) the rotational curves of spiral galaxies, even though the particle physicists have yet to find any evidence for the elusive stuff. Stay tuned for more news about sterile neutrinos and other possible detections. The peaks in the power spectra plot can apparently be decoded to show how much dark matter had to be present to explain the observed power spectra today. The peaks in the power spectrum are determined by the amounts of these three ingredients as calculated by the rules of general relativity in an expanding universe. 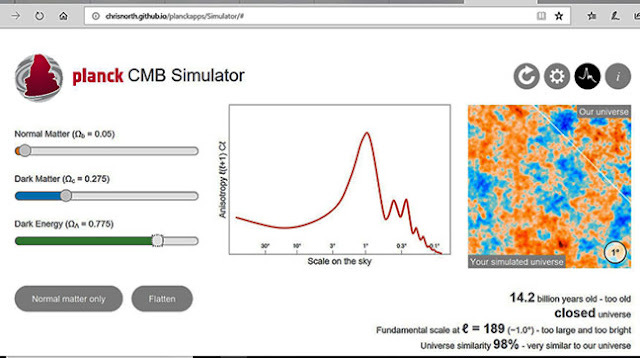 Note how well the simulated universe matches the actual image of "our universe." Alex, went on to say that the modern definition of galaxy has been updated to include a certain portion of dark matter. 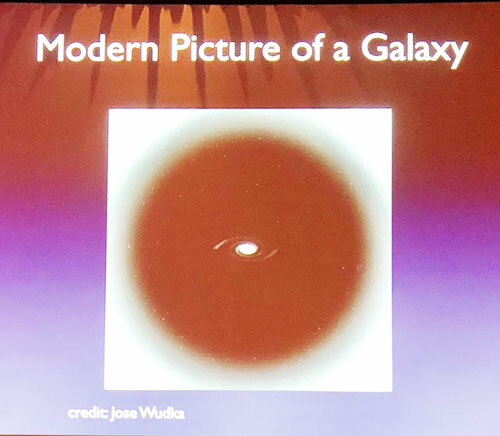 He showed a slide, similar to the one below, which I saw at the recent AAS summer meeting in Denver, but which shows that the galaxies are more than the pretty images of spirals and such that we see quite often now in images, but that the dark matter is the more significant part of the galaxy. This first slide from Profession Geha's presentation is interesting in that it shows the amount of sky that has been scanned for ultra-faint galaxies. You will probably remember that when cosmological simulations have been performed, they indicated that more faint galaxies should be present around the typical galaxy, like the Milky Way. But the faint galaxies had not been observed, which was then called the "missing galaxy problem." But maybe, the problem is just that the amount of sky, outlined in grey in the slide, which has already been scanned for faint dwarf galaxies, is just a small portion of the total sky and this might be why the faint galaxies have not yet been observed. Alex presented a slightly newer map with more of the sky down and around Sculptor and Fornax galaxies filled in. 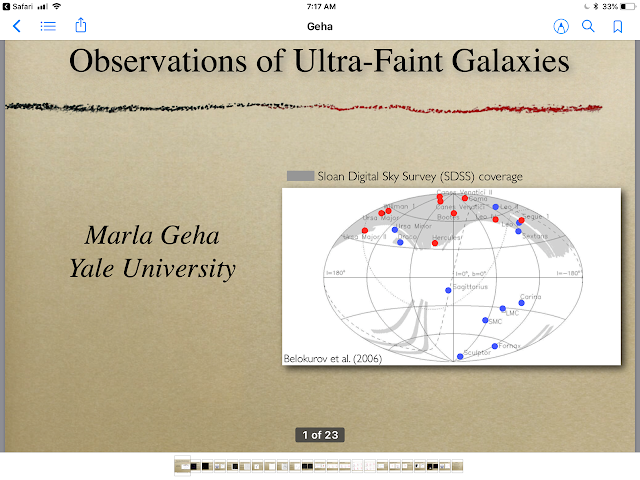 But as Alex went on to explain, and as outlined in the slide below from Geha's presentation, the ultra-faint dwarf galaxies are very hard to see given the bright foreground stars in the Milky Way. In addition, new techniques, not just looking deeper, are necessary. What is necessary is to get spectrographic data for all of the stars and doppler shift data for all the stars and from all of that data remove all of the foreground stars and collect only those remaining stars that are gravitationally bound together as a small dwarf galaxy. Alex descried how it was necessary to have the cooperation of several different telescope observatories to gather all the spectral and doppler shift data on all of the stars so that all of the foreground stars could be removed from the study. The slide below shows the final product for one such search for a dwarf galaxy. 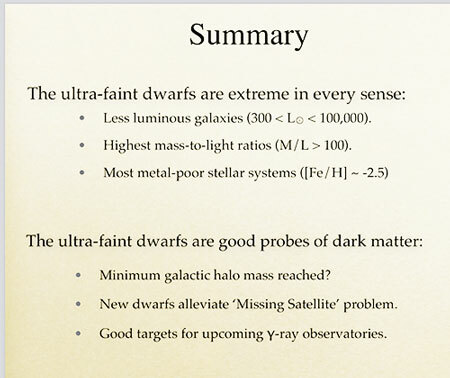 So, in summary, and using Geha's summary slide, we see why these ultra-faint dwarf galaxies have been so hard to see and find and why they are extreme in every sense. Each of these dwarfs often has 100 times the amount of dark matter as is projected for the Milky Way alone. This makes them ideal objects to look for investigating dark matter particle annihilations and interactions since the galaxies are not dominated by as much by ordinary matter and stars. 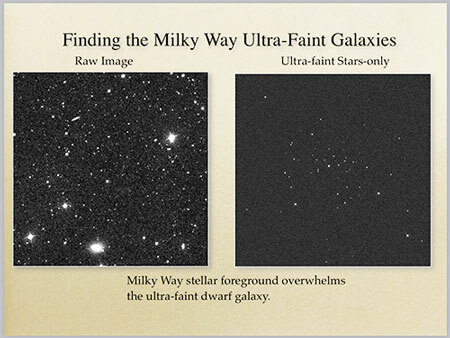 There will be interesting findings coming out of these ultra-faint dwarf galaxies.